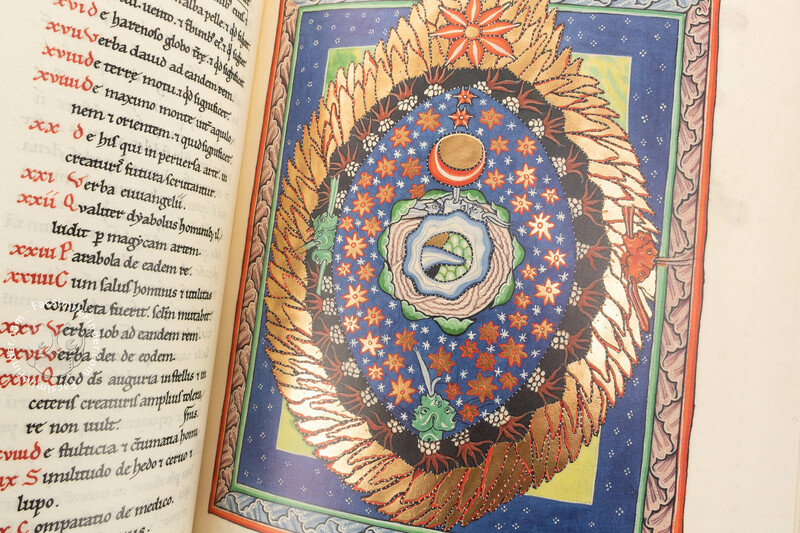 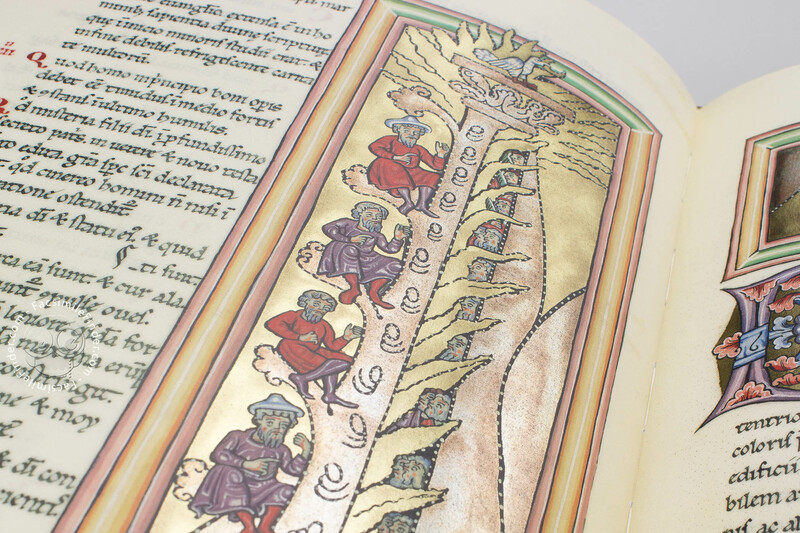 The Liber Scivias is the first theological-cosmological work by Hildegard of Bingen (1098-1179), a woman whose character and ability has earned her an appreciation which is unprecedented. 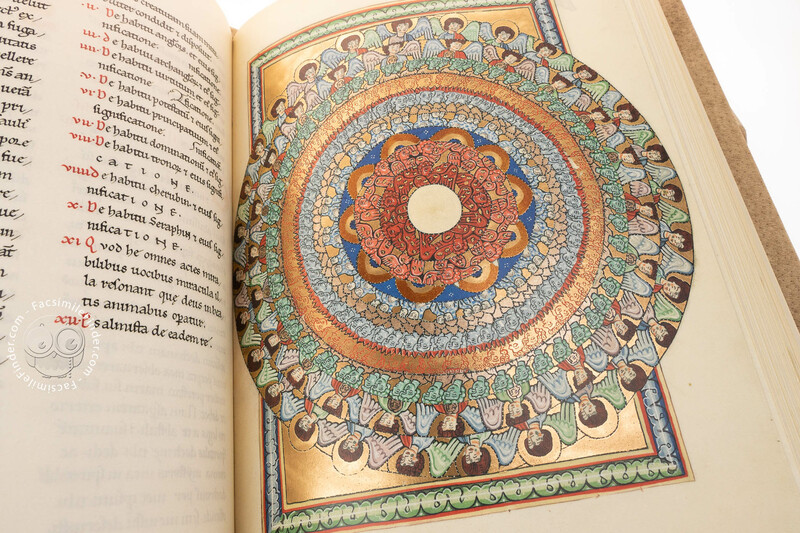 The manuscript – to be considered as a guide – takes into consideration the concepts of Universe and man, respectively representing macrocosm and microcosm, and deals with the process of salvation which can only be attained through redemption. 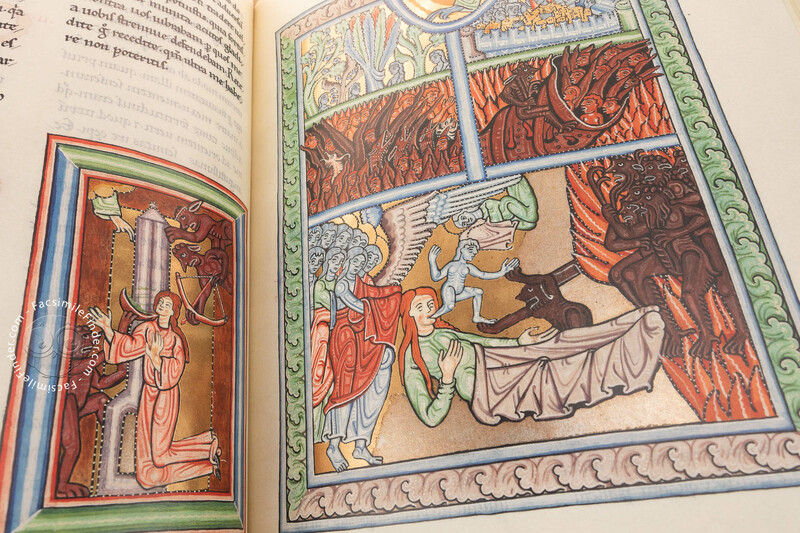 The figure of Hildegard resonates through the pages of the Liber Scivias manuscript – on which she worked for about 10 years – that is testament to her role as prophet and mystic. Indeed, she was an extraordinary woman in that she experienced visions which – as she claims herself – did not receive in a dream or sleep but in a conscious state. 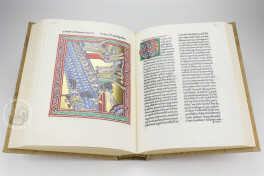 A vision introduces each section, focusing on the interaction between God and man, who aiming to redeem himself finds his way back to his creator. 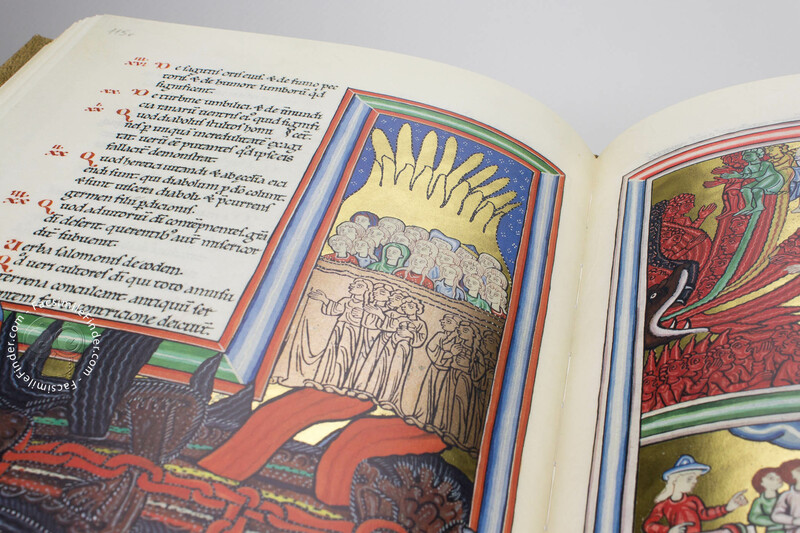 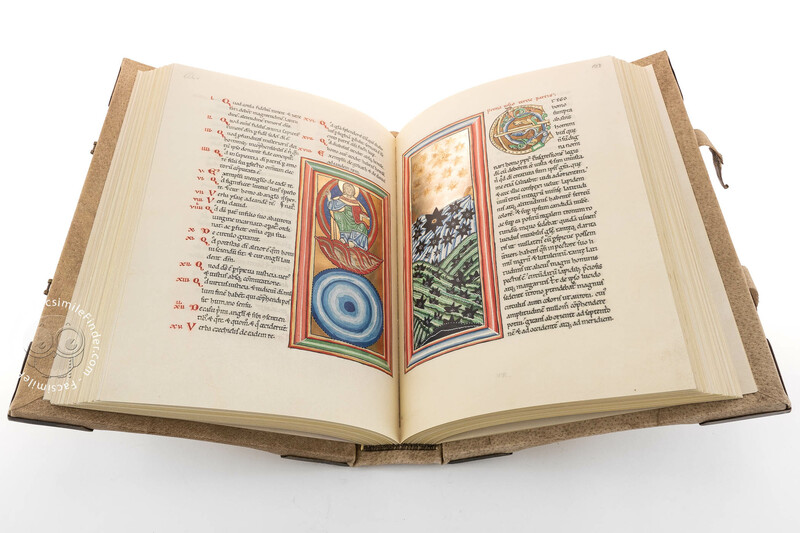 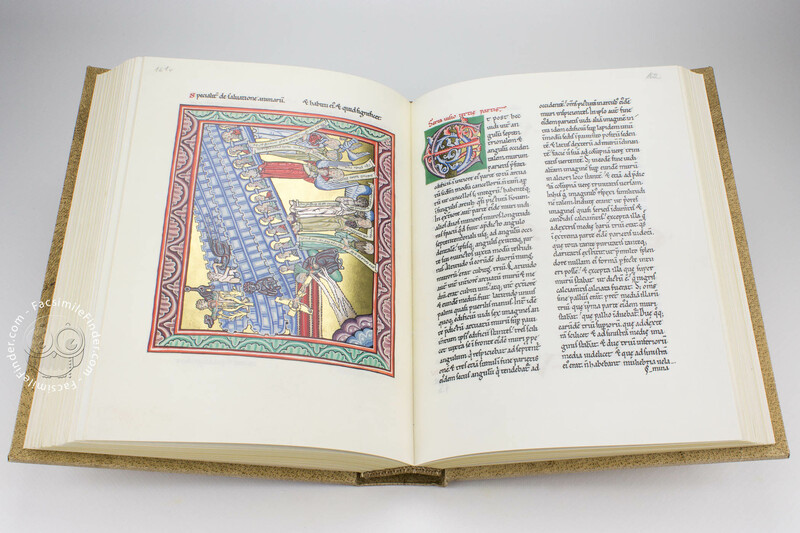 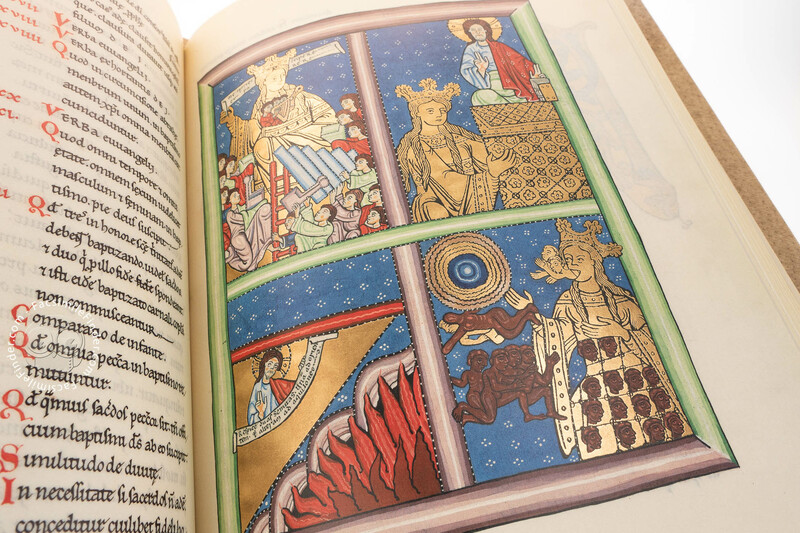 The Liber Scivias with its 35 exquisitely illuminated miniatures was created in the monastery of Rupertsberg and it is justly considered one of the most lavish and sumptuously decorated medieval manuscripts. 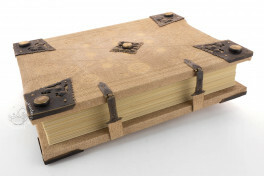 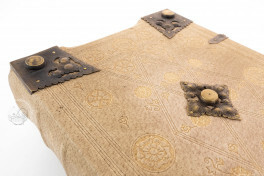 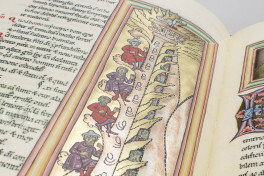 The codex makes sure to connect men with the transcendent beyond they long for; it represents the hope for men to live a meaningful existence. 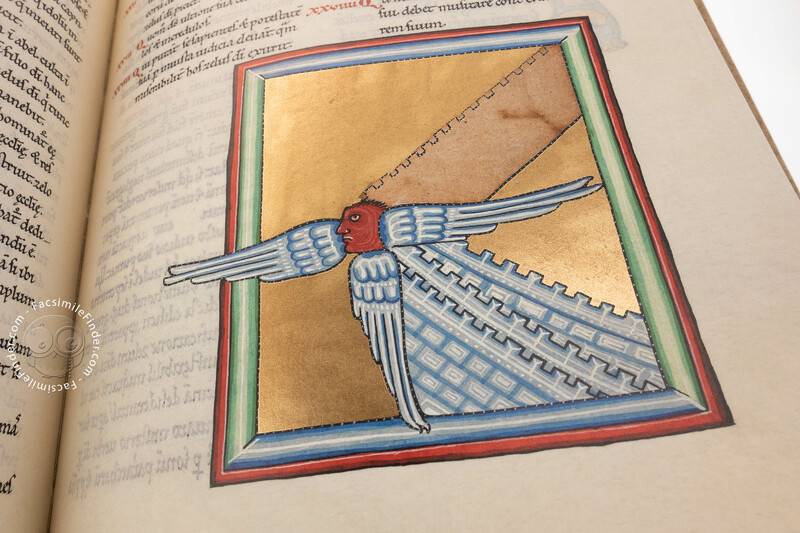 Fortunately, the manuscript has survived time with help of abbess Regentrudis Sauter, who thought of the Liber Scivias as the perfect artefact to dedicate for the golden anniversary of the order. 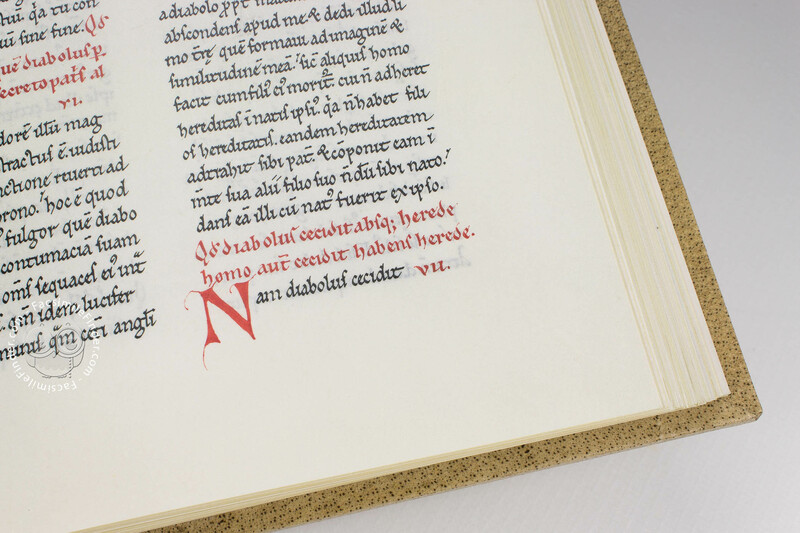 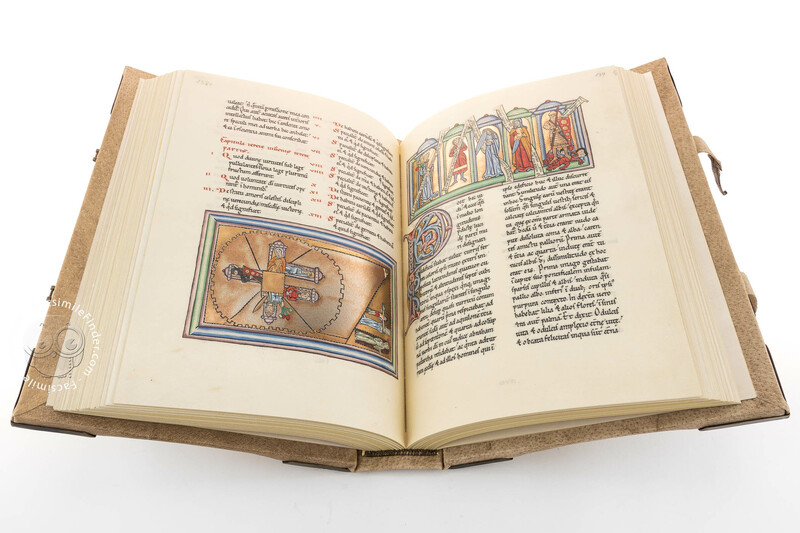 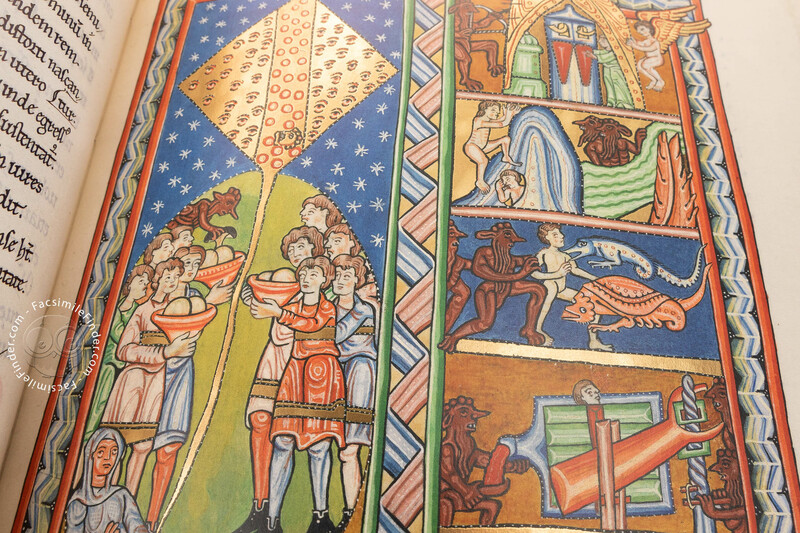 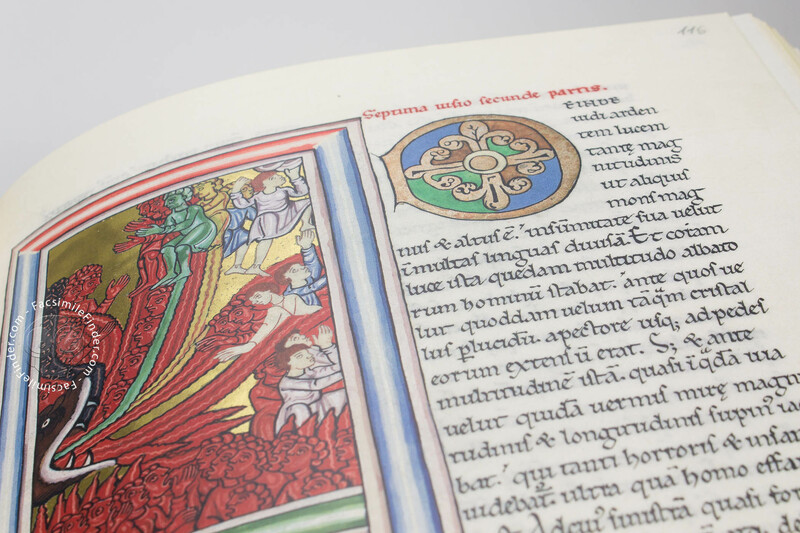 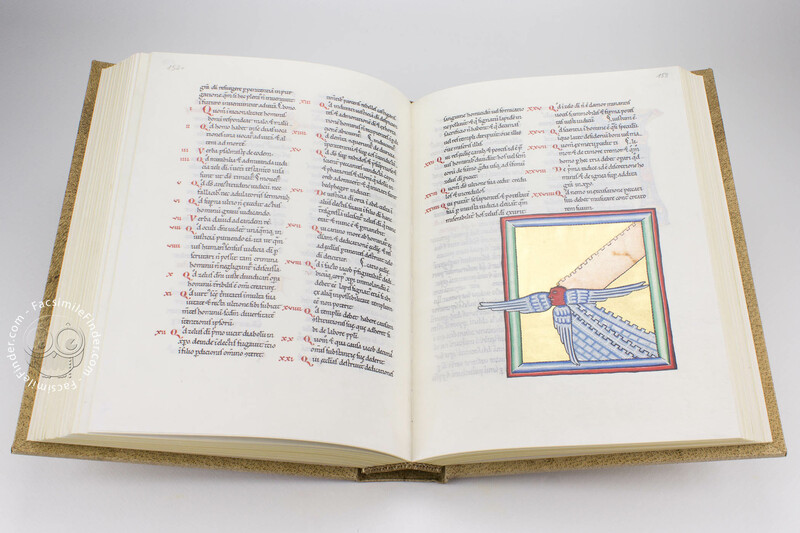 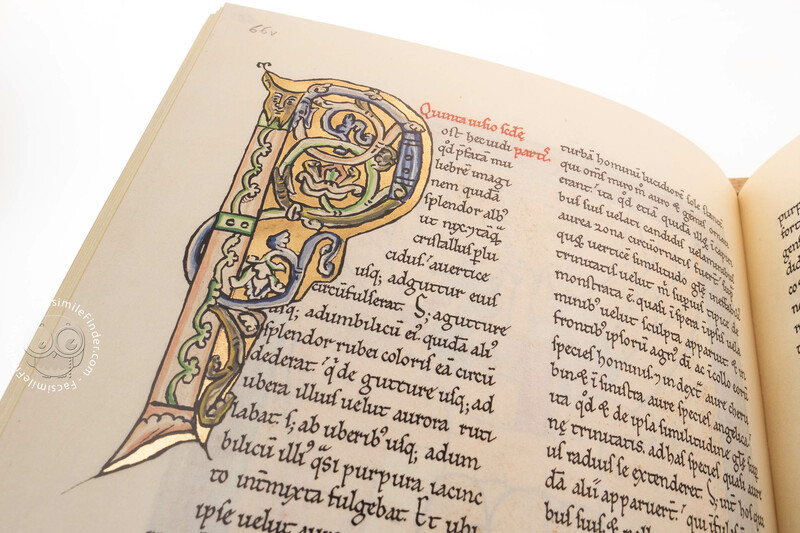 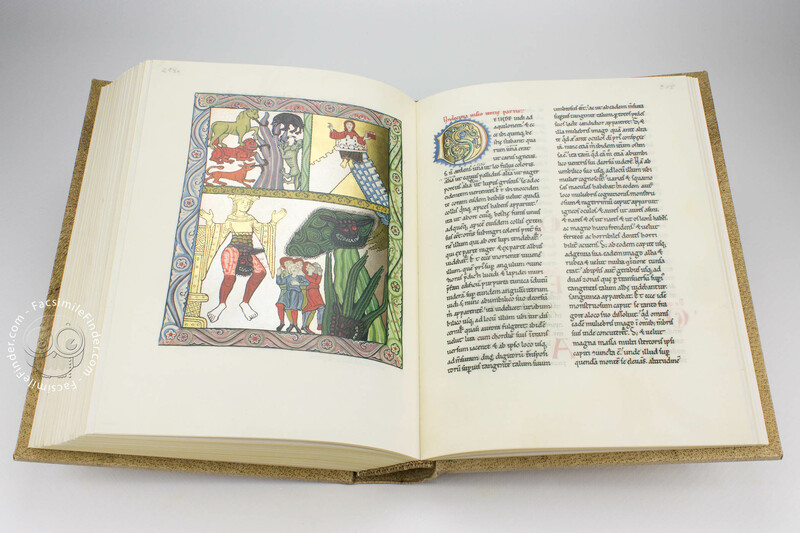 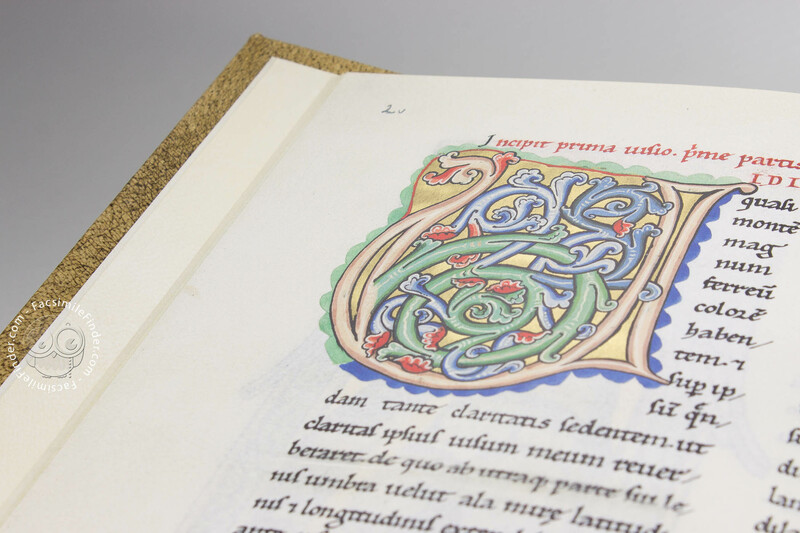 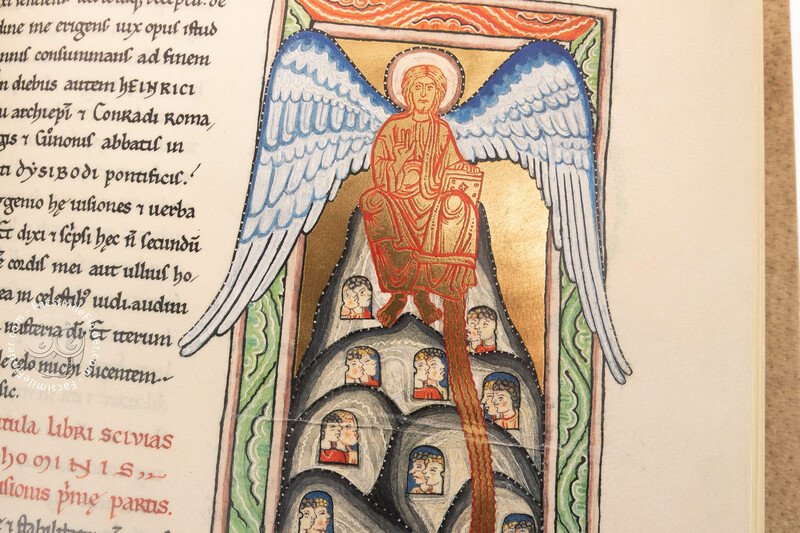 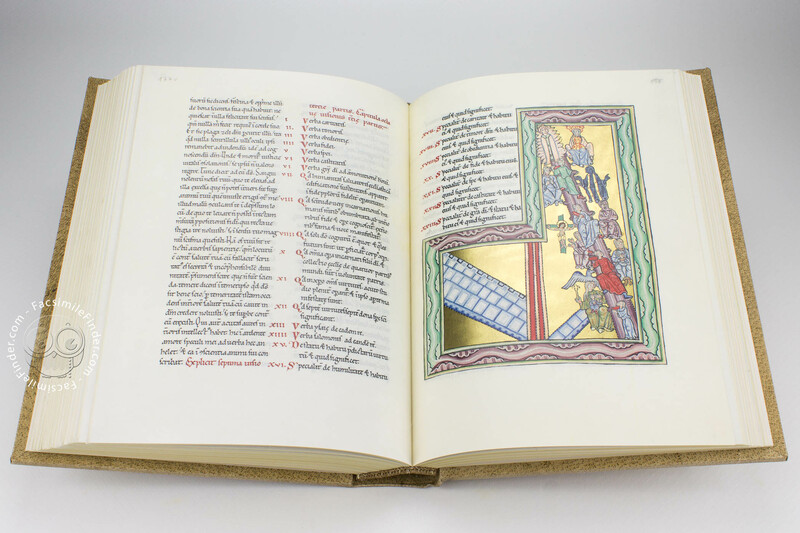 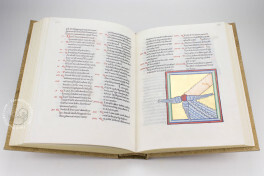 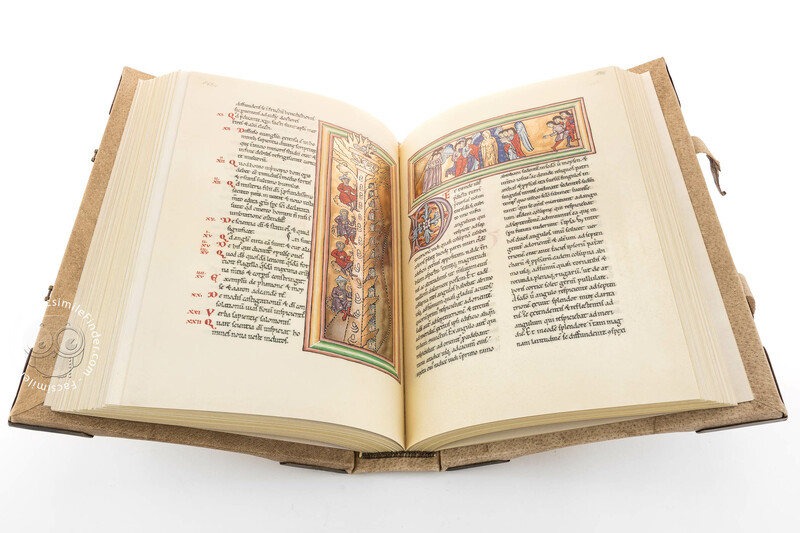 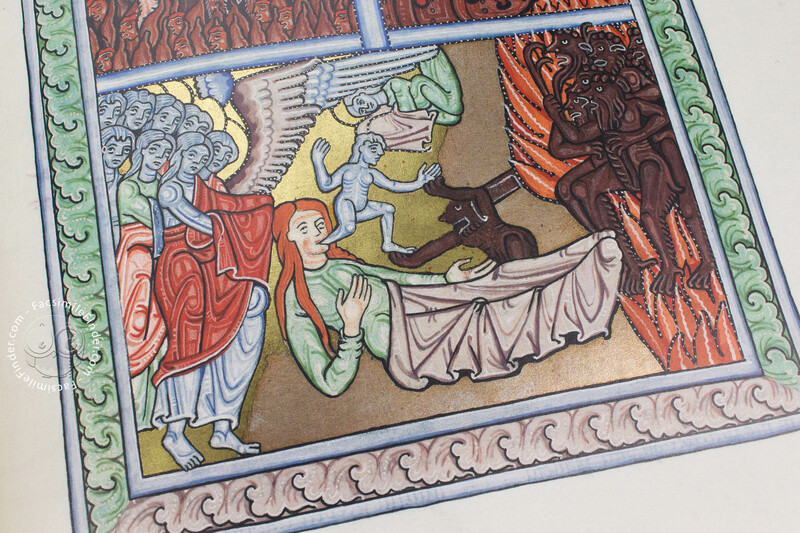 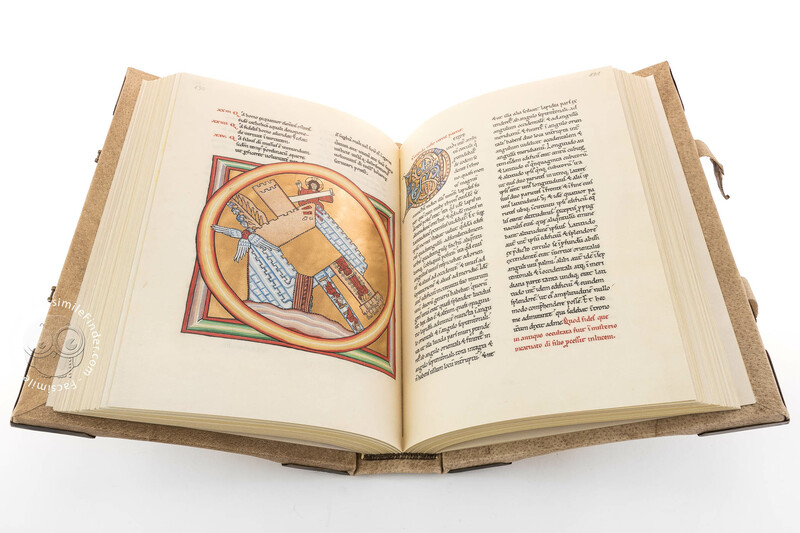 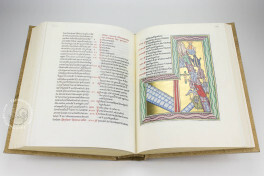 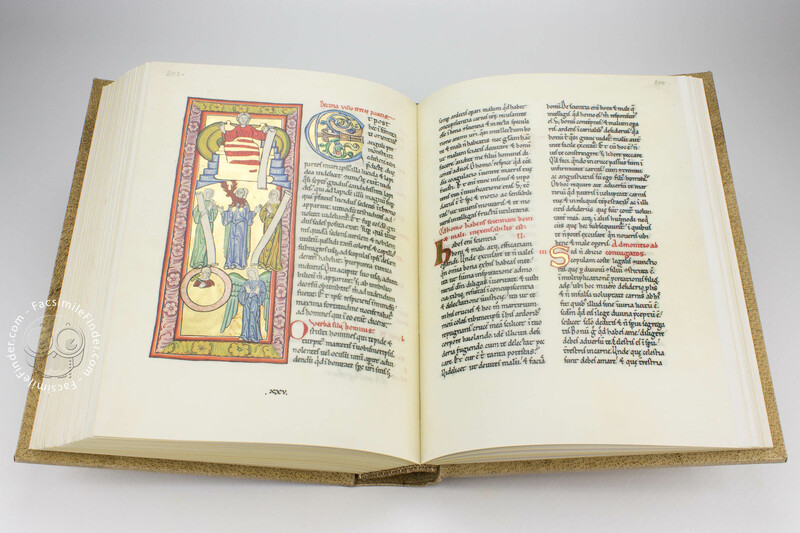 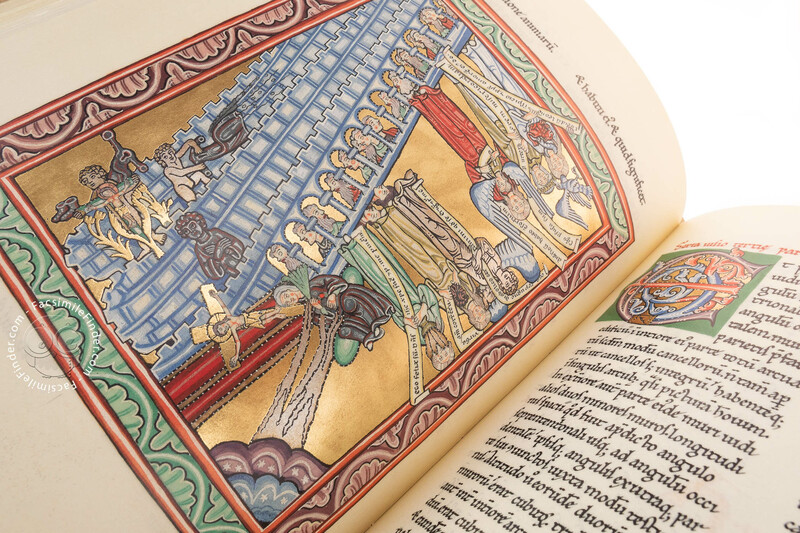 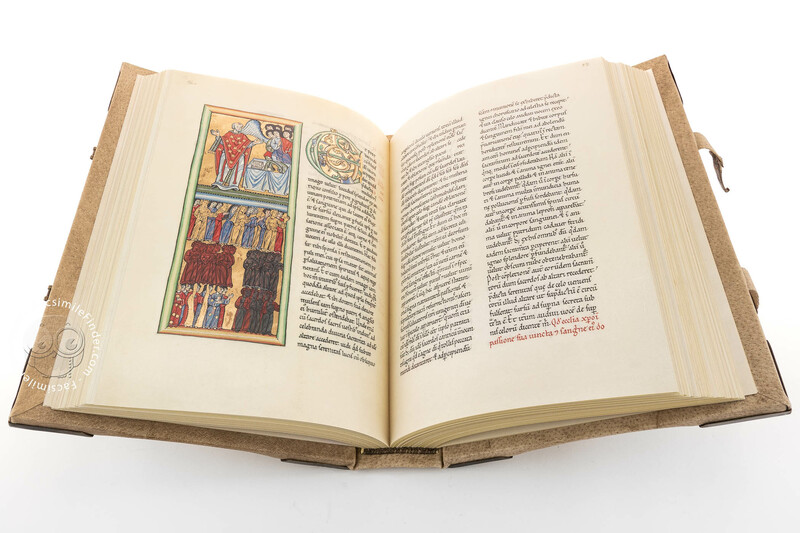 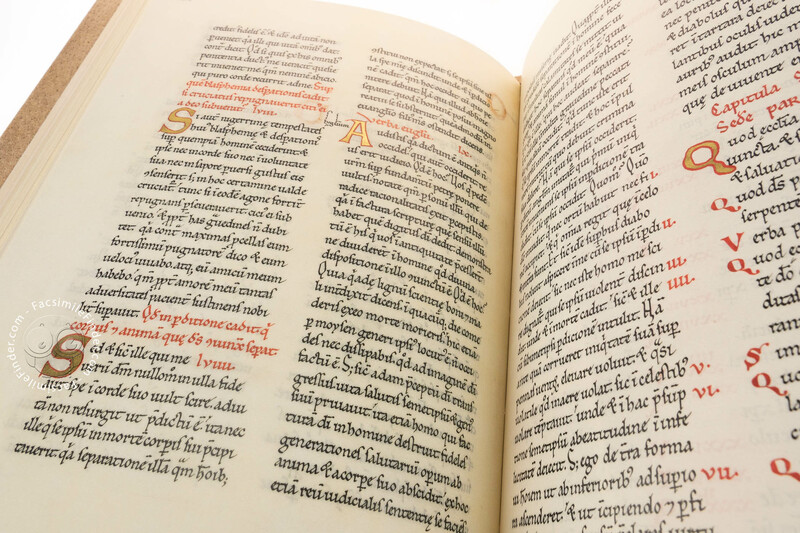 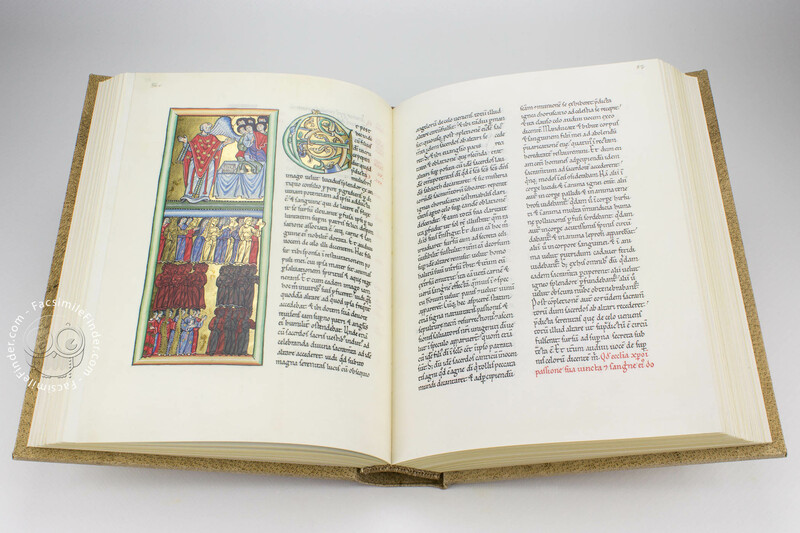 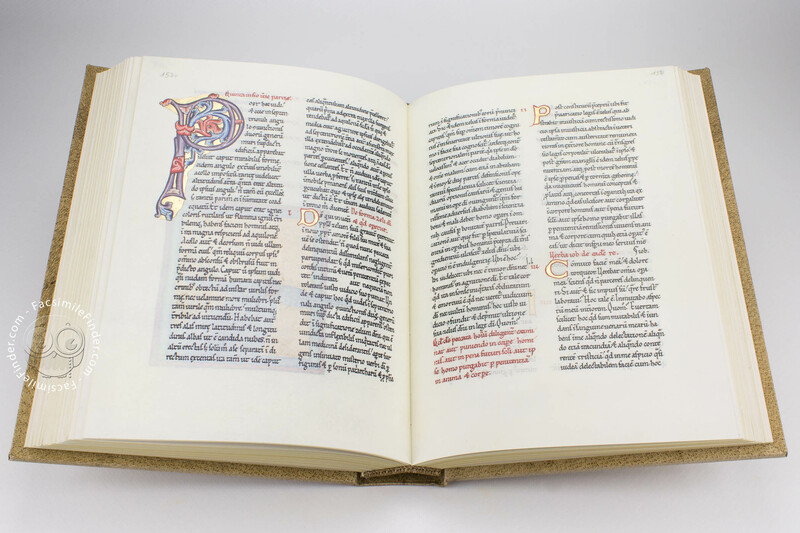 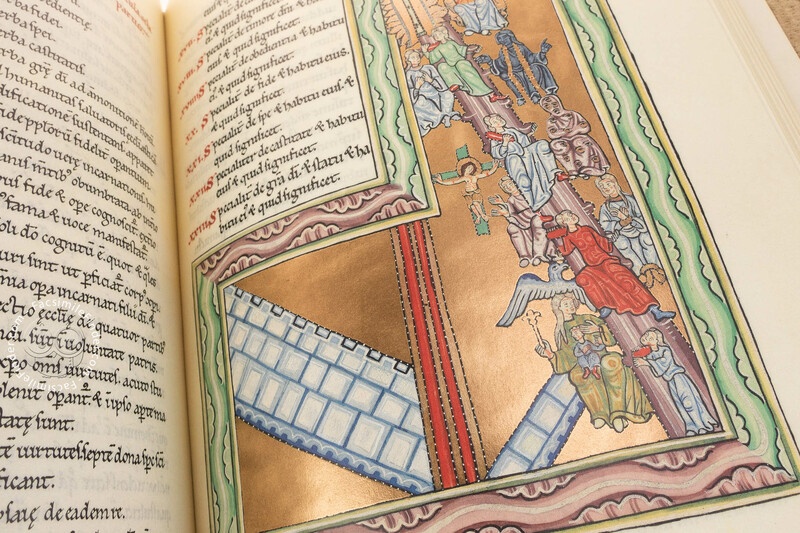 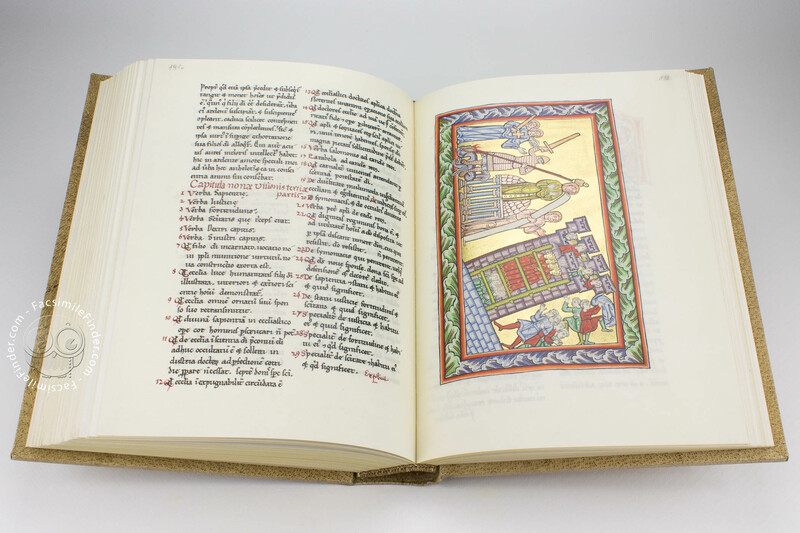 For six years, from 1927 to 1933, the manuscript was relocated in the abbey of St. Hildegard to be copied by four nuns who, transcribed the original text and copied the miniatures. 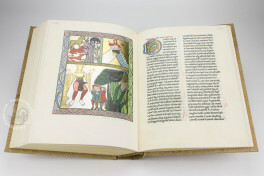 This instance was considered to be very fortunate when the original manuscript went lost during the Second World War, thus leaving the world with only the 19th century copy. The nuns created a version of the cover which did not reflect the actual state of the cover at the time it went missing. 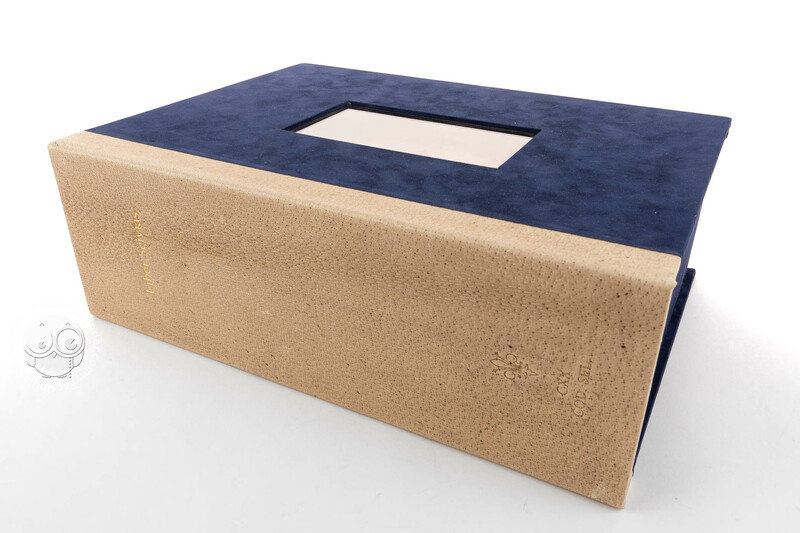 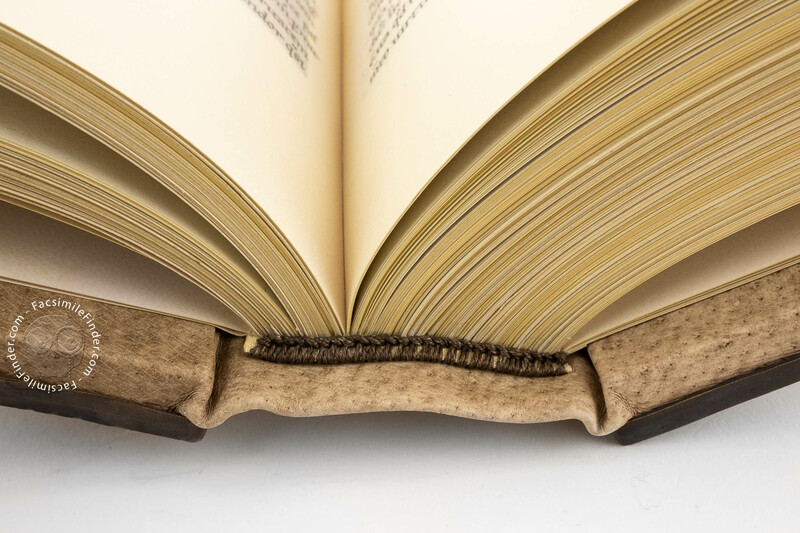 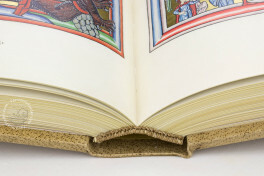 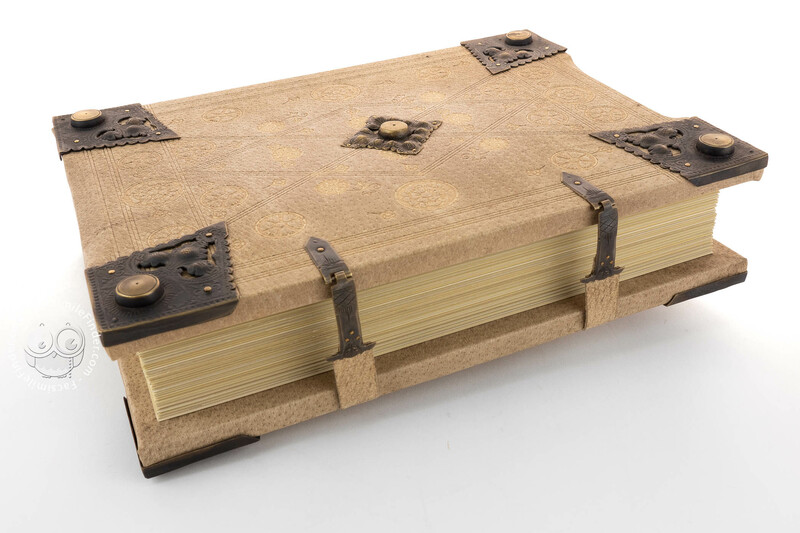 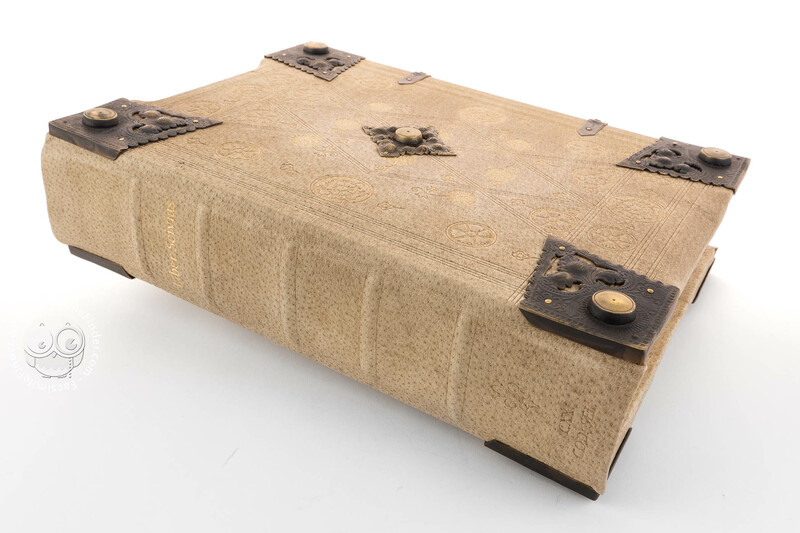 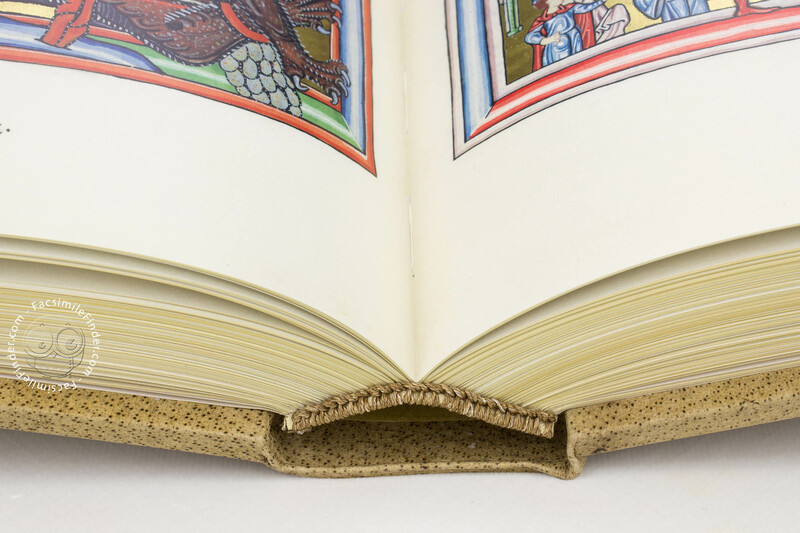 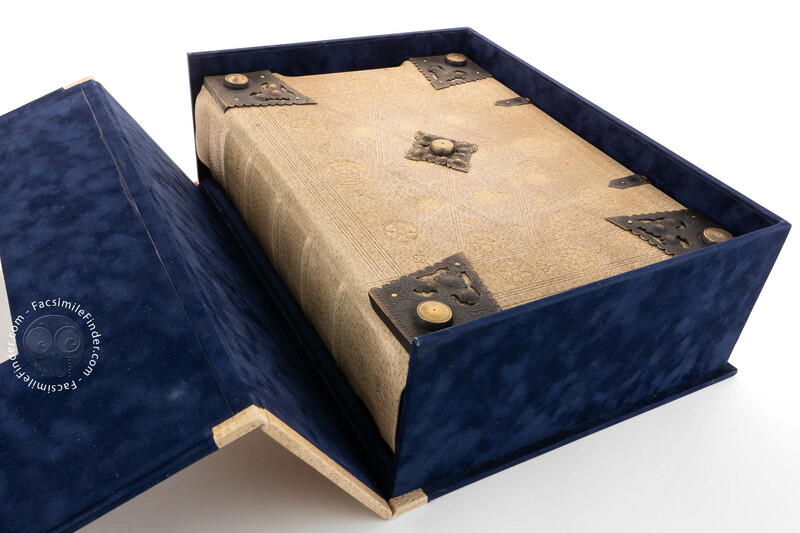 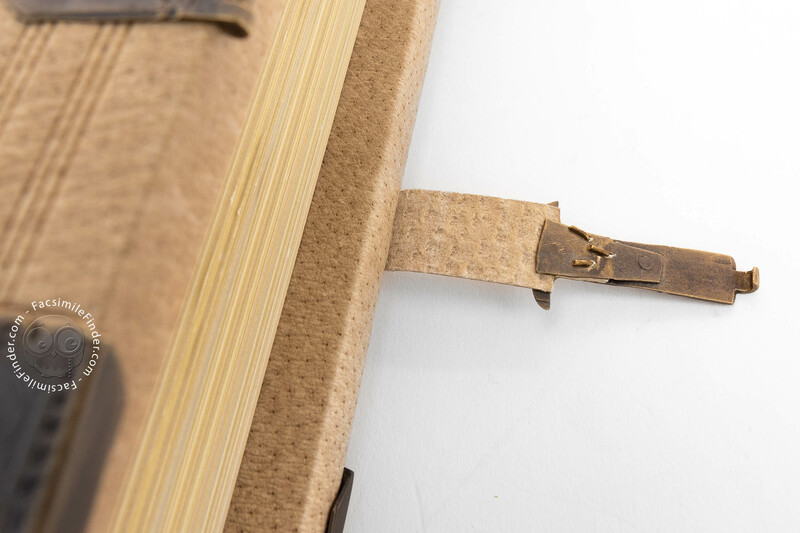 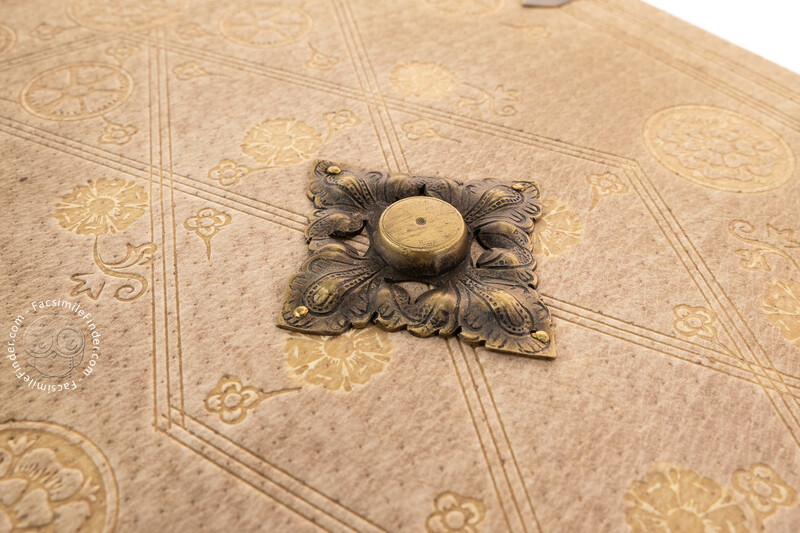 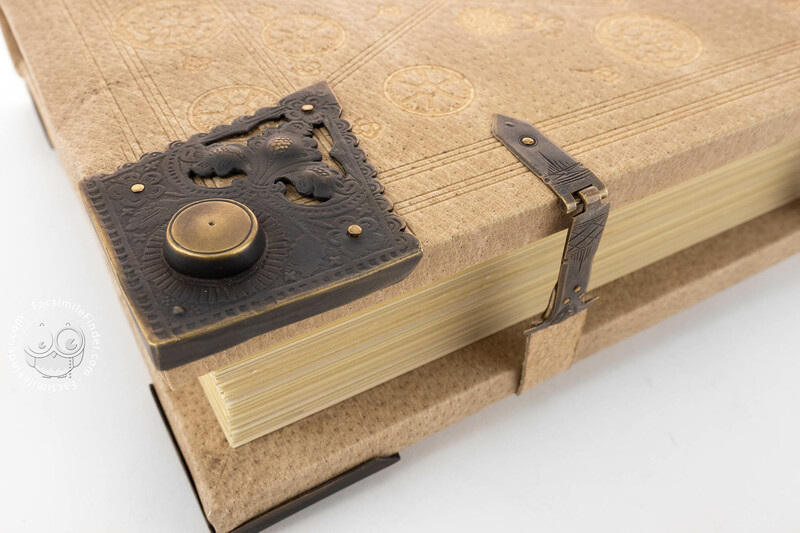 Fortunately, a record from the year 1931 supplies a detailed description of the original binding providing the number of existing embossments and fittings, as well as the surviving clasps on the leather cover. 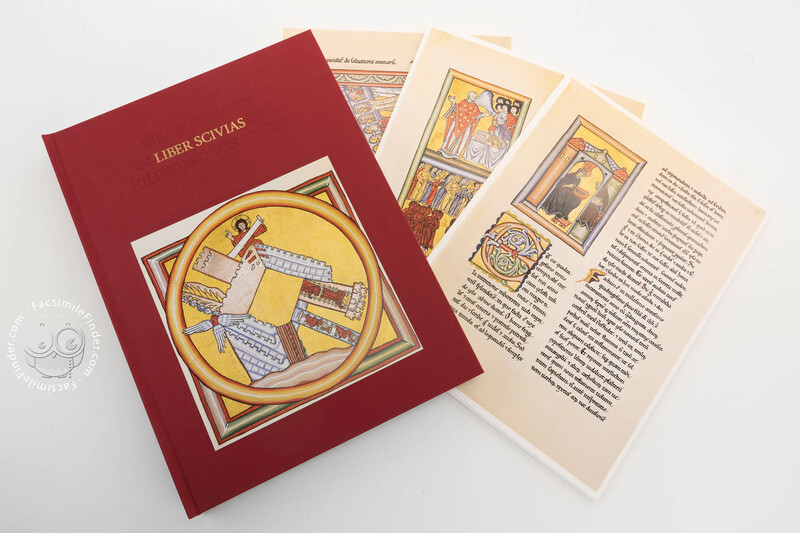 We are also informed that the singular stamp used on the Liber Scivias is identical to the one on the so-called Giant Codex of Hildegard of Bingen (Hs.2). 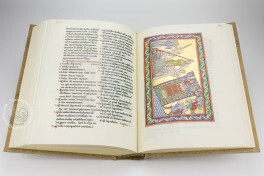 Manuscript book on parchment − 32.5 × 23.5 cm − 242 pp. 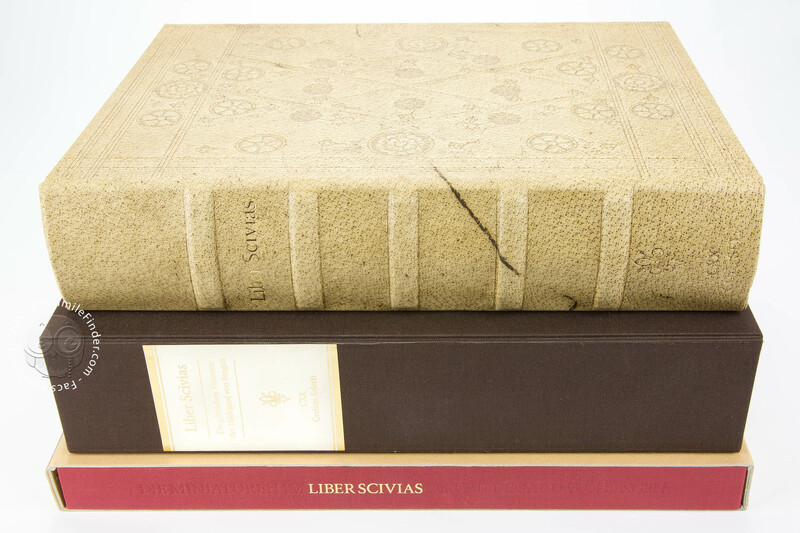 Liber Scivias (Normal Edition) facsimile edition by Adeva. 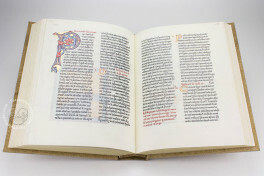 Commentary (German) by Heieck, Mechthild; Zátonyi, Sr. Maura; Saurma-Jeltsch, Lieselotte E.
Full-size color reproduction of the entire original document, Liber Scivias: the facsimile attempts to replicate the look-and-feel and physical features of the original document; pages are trimmed according to the original format; the binding might not be consistent with the current document binding. 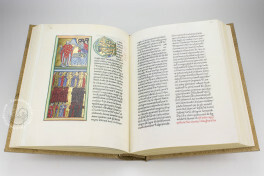 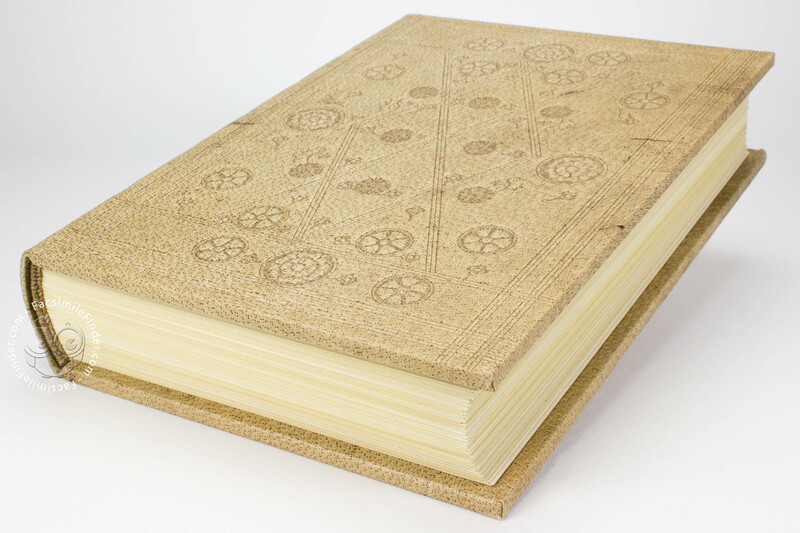 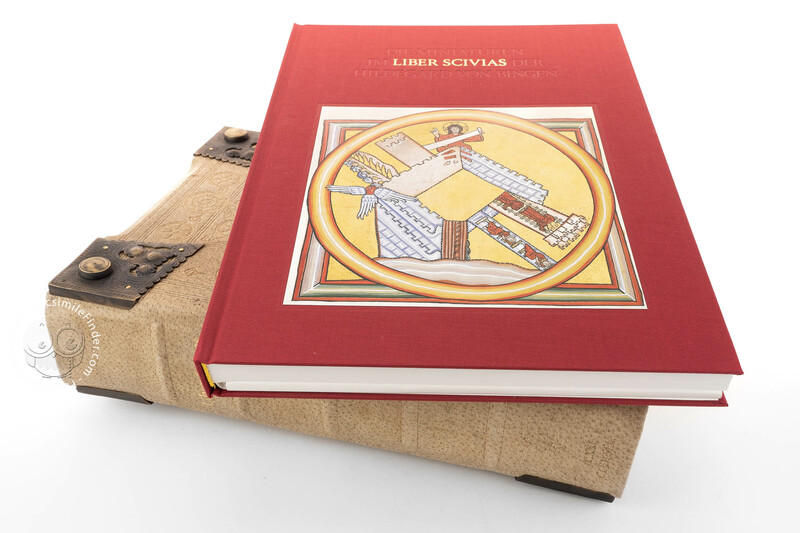 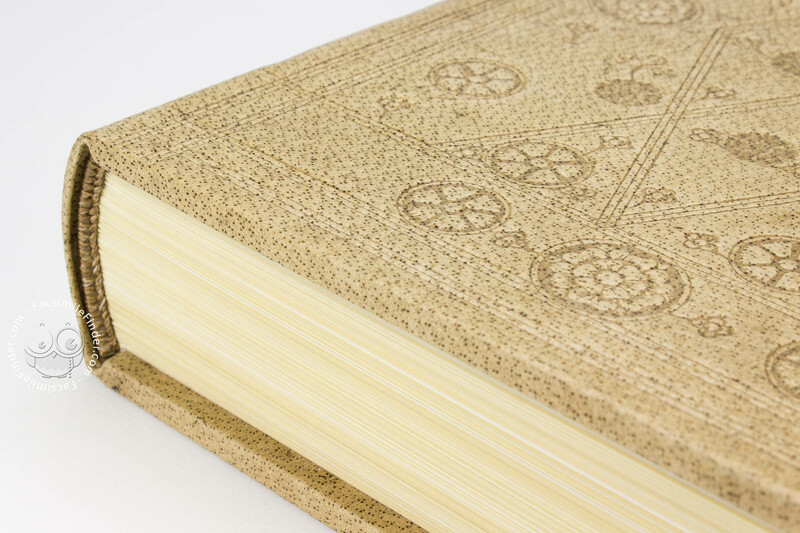 Liber Scivias (Real Gold Edition) facsimile edition by Adeva. 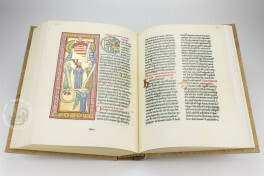 Commentary (German) by Saurma-Jeltsch, Lieselotte E.
Golden features reproduced in real gold.